The latest town centre community breakfast had a special guest when the Mayor of Oldham, Councillor Ann Wingate, dropped in for a slice of toast before her official duties. It was held at the Salt Cellar cafe in Church Lane, hosted by ministers from the Town Centre Chaplaincy which offers workers in shops, businesses and services a listening ear and a friendly face. 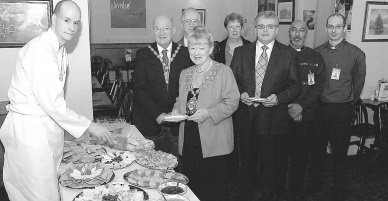 The Salt Cellar chef manager Mike Bartrop is pictured serving the Mayor and her consort, Ken Wingate, with a tasty breakfast. Also at the breakfast were chaplaincy ministers (from the left) John Piper and Sheila Coop, Spindles Town Square security manager Tim O’Callaghan and ministers Donny Meyer and Rick Preston.